The Devsigner Conference features sessions and workshops focusing on front web design and development techniques, tips and tools. We also aim to inspire our technically inclined creative community with amazing session topics that bridge the gap between art and code. 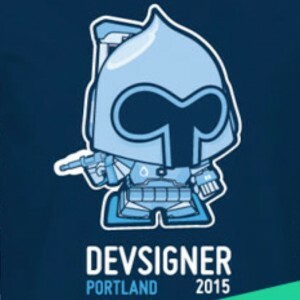 Join us June 27-28th in Portland, Oregon for our second annual celebration of Devsigners. Confession – I’m not a dev. But I have spent years designing learning experiences. So my session is titled the Teacher’s Guide to Ed Design. (Sat 11:45am-12:30pm). My workshop session will offer perspectives on designing engaging learning experiences that motivate students, provoke their reflections and monitor their progress as learners. 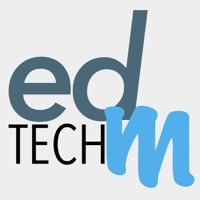 It should be useful for educational content providers or anyone interested in instructional design. 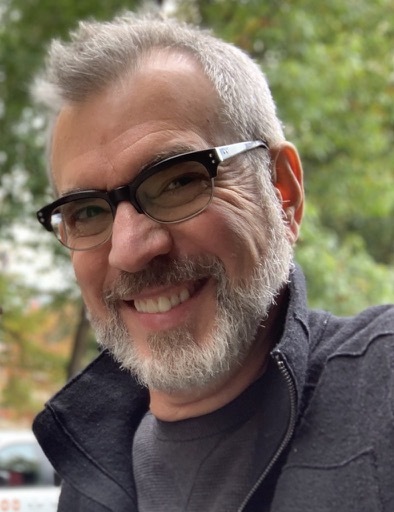 This post provides an overview of my session and provide links for my workshop attendees. Have the courage to be less helpful. Are students making choices, reflecting on decisions and sharing their thinking with an audience beyond the teacher? Teaching is not telling. Teaching is designing learning experiences that provoke learner reflection. This happens best when lessons have a social component and an authentic audience. Let the student be the historian.. . or scientist, mathematician, etc. Think of the art class. Would you expect to see the students passively watching the art teacher paint? In the digital age, sharing information is easy. Why waste classroom time simply transferring information to your students? It’s assimilating content and developing skills that are the challenge. Flip the content to the “homework” and you can free up more classroom time for student interaction, peer teaching, and reflection. During our sessions we will share tech tools, design and delivery strategies. Between sessions participants will use the lessons we design and return to reflect on successes and challenges in a lesson study approach. Times: 9:00 am to 4:00 pm. Seats are limited, so don’t delay. Sign up deadline Jan 9, 2015. 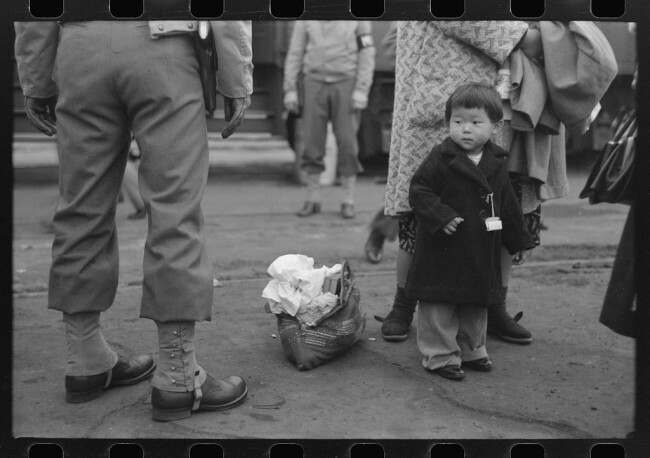 While many are aware that the US government forcibly removed and incarcerated more than 120,000 U.S. residents of Japanese ancestry during WWII. Few people know that the government recruited some of these same people to work at farm labor camps across the west to harvest crops essential to the war effort. 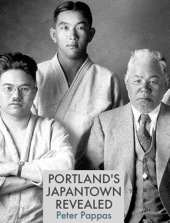 Uprooted: Japanese American Farm Labor Camps During World War II is a traveling photography exhibit (and website) that tells this story and provides a treasure trove of resources for historians, teachers and students. Uprooted draws from images of Japanese American farm labor camps taken by Russell Lee in the summer of 1942. Lee worked as a staff photographer for the Farm Security Administration (FSA), a federal agency that between 1935 and 1944 produced approximately 175,000 black-and-white film negatives and 1,600 color photographs. A video made in the era being studied or a video made over seventy years later? A video made by the United States government or a video made by documentary filmmakers? A video narrative by a government official or a video narrated by people who participated in the event? The lesson then guides students through comparisons of both videos based on close reading strategies – what does the video say? how does it say it? what does it mean to me? A complete lesson plan, collection of images and historic documents is available at Uprooted. A second lesson plan considers the question: How reliable are documentary photographs as a historic source? (1.1, 1.2, 1.3) The site even includes a kit for students to curate their own Uprooted museum mini-exhibit. I’d like to close this post by crediting the talented team behind Uprooted. Curator – Morgen Young, Web and Graphics Designer –Melissa Delzio, Videographers – Courtney Hermann and Kerribeth Elliott. Uprooted is a project of the Oregon Cultural Heritage Commission. Here’s a suggestion for your back-to-school faculty meeting – take 15 minutes to watch Humans Need Not Apply by CGP Grey. Then have a discussion on it’s implications for your students and (your curriculum). 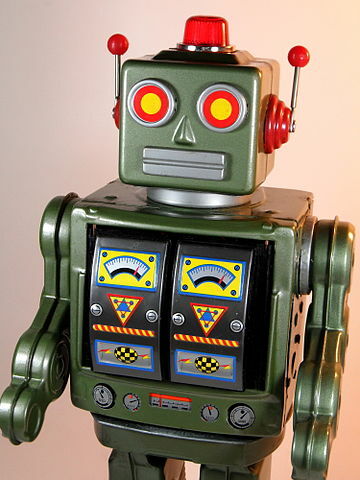 Talking about robot invasions is way more fun than updates on new state tests. The video’s thesis is simple – robots are coming for our jobs. Actually, they have already taken many of them. And it’s not just low-skilled labor they’re taking over. … white-collar work is no safe haven either. If your job is sitting in front of a screen and typing and clicking — like maybe you’re supposed to be doing right now — the bots are coming for you too, buddy. I’ll bet that accurately filling out a worksheet won’t be a valued bot-competitive skill. It begs the question – what skills should we be teaching to students who will have to compete against the bots for employment? I don’t think there are any easy answers to that question. But I’ll bet that accurately filling out a worksheet won’t be a valued bot-competitive skill. We have been through economic revolutions before, but the robot revolution is different. Horses aren’t unemployed now because they got lazy as a species, they’re unemployable. There’s little work a horse can do that do that pays for its housing and hay. For full text of the video click here. Many are familiar with the work of Lee’s colleague Dorothea Lange, who worked for the War Relocation Authority in 1942. Lee also made significant contributions to the photographic record of the Nikkei wartime experience. 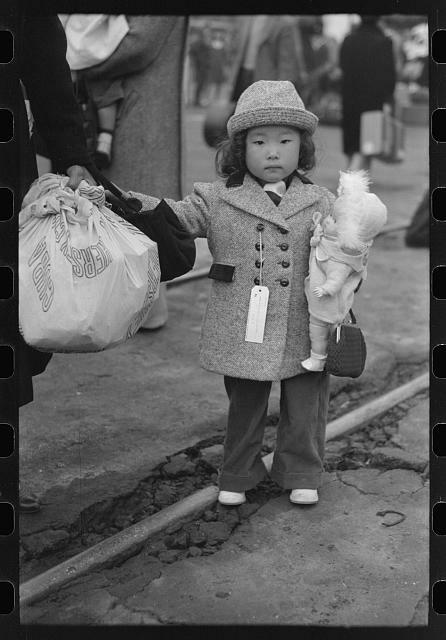 Between April and August of 1942, he took some six hundred images of Japanese Americans in California, Oregon, and Idaho, including rare documentation of farm labor camps. 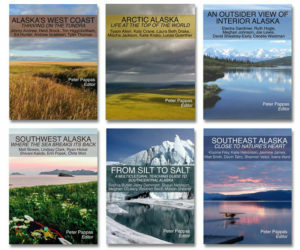 To explore all of Lee’s FSA photographs, visit the Library of Congress website. Uprooted also features video interviews with Japanese Americans who lived and worked in these seasonal farm labor camps as well as an archive of engaging historic documents from the era. Lee’s photographs depict smiling Japanese Americans cheerfully making the best of farm work and living in tents. But the interviews and historic documents tell a different story – harsh fieldwork, substandard living conditions and local townspeople suspicious of these intruders and their “questionable loyalty.” Even the incarcerated Japanese Americans were divided about working in the farm labor camps. Some saw it as an better alternative than the barbed wire of camps like Manzanar or Minidoka. But others resisted after hearing stories of grueling “stoop” labor, primitive housing and hostile locals. While Uprooted focuses on a what some might consider a “footnote” of the US WWII homefront experience, I recognized that this rich collection could provide students with the material to develop historical thinking skills in sourcing, contextualizing, corroborating and close reading. How does this collection of video interviews and historic documents help shed light on Lee’s intent? Was he trying to gloss over the harsh living and working conditions to help recruit more farm laborers? Was he trying to depict the noble and patriotic sacrifice of Japanese Americans forcibly stripped of their homes and livelihoods following the attack on Pearl Harbor by Japanese warplanes? Or did Lee simply shoot what he saw while on a photo assignment for the FSA? I worked with the Uprooted team and developed a lesson How reliable are documentary photographs as a historic source? (1.1 Teachers Guide, 1.2 Photographs, 1.3 Documents) Students begin by reflecting on the photographs they take and often share on social media. What do you see in the photographs? What stories do they tell? Next they are taken through scaffolded activities to closely examine Lee’s photographs and compare them to the often conflicting depictions of the farm labor camps found in the other historic documents. Finally they are asked to reconsider their contemporary social media photographs and how they might be interpreted by future historian studying “the life of a teenager in 2010s.” A complete lesson plan, collection of images and historic documents is available at Uprooted. The site even includes a kit for students to curate their own Uprooted museum mini-exhibit. A second lesson plan is also available. How reliable are documentary films as a historic source? Lesson plan 2. I’d like to close this post by crediting the talented team behind Uprooted. Curator – Morgen Young, Web and Graphics Designer – Melissa Delzio, Videographers - Courtney Hermann and Kerribeth Elliott. Uprooted is a project of the Oregon Cultural Heritage Commission. Newspaper Ad “You don’t need to wait any longer to get out.” From the Minidoka Irrigator. 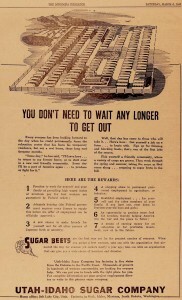 Sugar companies posted recruitment notices and advertisements in public spaces throughout the camps, as well as in camp newspapers. 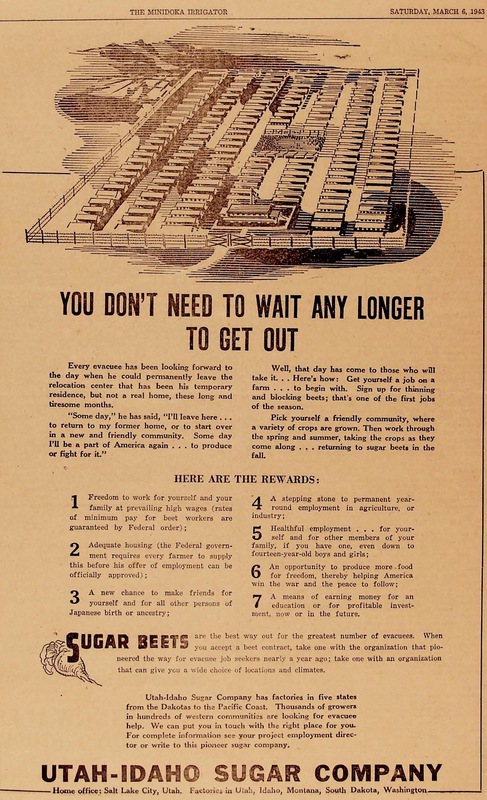 Such advertisements emphasized seasonal labor as an opportunity to leave confines of camp, but also marketed the work as the patriotic duty of Japanese Americans, ignoring that they had been incarcerated and denied their civil liberties. National Archives and Records Administration, Washington D.C., Record Group 210, War Relocation Authority.